Wild potato vine (Ipomoea pandurata) of the Morning Glory (Convolvulaceae) family is a herbaceous (non-woody) perennial vine. It occurs in the US from Texas to Nebraska and eastward and southward to the borders. 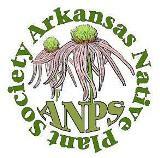 In Arkansas, it occurs statewide. 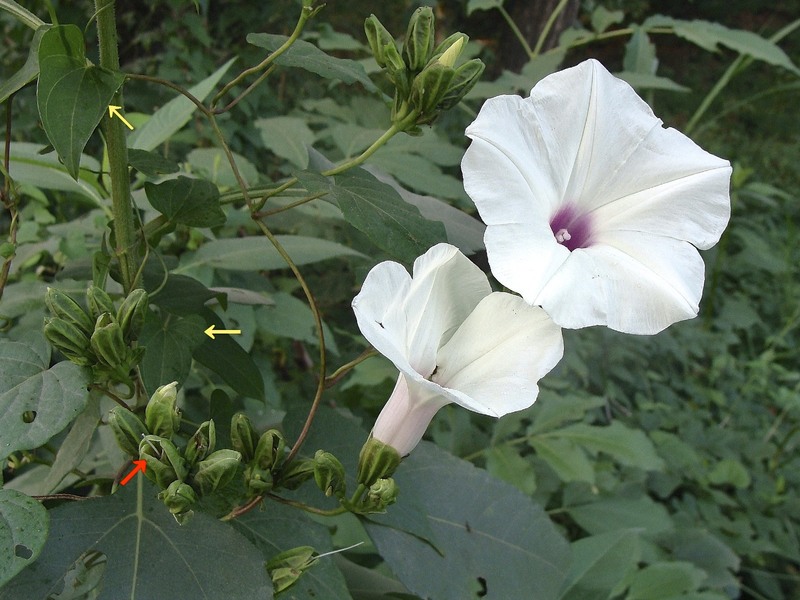 Other common names include potato vine, wild sweet potato, man-of-the-earth and big root morning glory. The species grows in upland woodlands and thickets, edges of prairies, along roadsides, along stream banks and fence rows, in dry to moist sandy to rocky soils. The genus name is derived from several Greek words referring to the plants’ twining growth habit. The specific epithet pandurata means fiddle-shaped, presumably referring to the leaves, although they are typically more heart-shaped. Many of the common names relate to the edible cooked root with a bitter sweet potato taste (raw roots are a purgative). A large vertical tuberous root of 20 or more pounds produces several stems from its upper end that grow to sprawl across open areas and climb and twine with itself and other vines or over other plants. Stems, stretched out, can be 20 or more feet long. Stems, usually glabrous, are round in cross section. The stems and petioles may be purplish on sides facing the sun, while green on sides shaded from the sun. Plants have a whitish sap and lack tendrils. Plants are drought resistant. 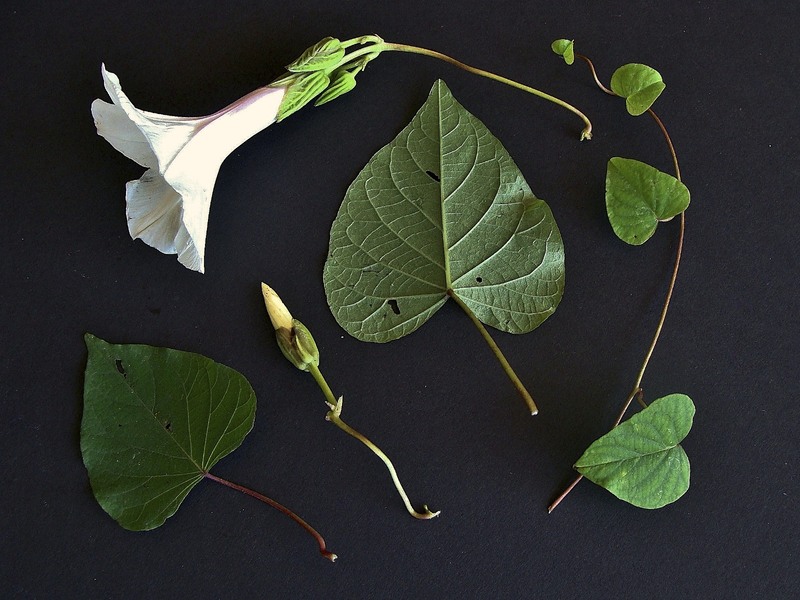 Leaves of wild potato vine are mostly glabrous, alternate, thin and entire with long petioles. Leaf blades, 3 inches long and up to 3 inches wide, are mostly cordate (heart-shaped), but leaves on smaller branches may be more oval. Upper leaf surface is slightly rough while the lower surface is smooth. Petioles, with an upper groove and often twisted at their bases, can be as long as the leaf blades. Both the upper and lower surfaces of the leaves are dark green. Appearance of leaves are similar to those of milkweed vines, but are alternate instead of opposite. Photo 1: A wild potato vine without competition that is growing over a brush pile. Leaves are similar in shape to milkweed vines, but are alternate, not opposite. Photo 2: Upper and lower sides of leaves along with a flower in bud and an open flower. Alternate leaves can be seen on the small stem. The inflorescence consists of stout branching peduncles, up to 3¾ inches long, arising from leaf axils. Peduncles bear one to eight or more flowers in a tight cluster in cyme-like fashion on pedicels ½ inch or more long. Typically, only one flower in a cluster opens at a time. Each pedicel is subtended by small bracts. Wild potato vine has many large showy flowers mid to late summer. The corolla is funnel-shaped (funnelform) with five broad shallow lobes. The white flowers are up to three inches long and about as wide with reddish-purple shading within the throats. A pair of thin incised lines from the edge of each lobe into the throat creates a star pattern in the fabric of the corolla. The throat widens at its middle. Five white filaments of unequal length are attached (adnate) to the corolla throat within. White anthers extend slightly from corolla throat. A white pistil, half as thick as the filaments and 1½ inches long, supports a round stigma in midst of anthers. Before being fertilized, the ovary at the base of the style is not obvious. A light green calyx tube is composed of five tightly overlapping ovate to elliptic sepals, ½ to ¾ inch long, with distinctive external longitudinal ridges (rugose). The two or three sepals on the outside of the calyx are larger, more ridged and darker green. The hairless calyx is soft and squeezable at its upper end and firm with larger ridges at its squared-off base. Photo 3: Wild potato vine growing in competition with other plants. Some flowers have already bloomed of which one is indicated by red arrow. Dark green leaves, indicated by yellow arrows, are of a separate and non-native vine that bears aerial “potatoes” called potato vine, cinnamon vine or Chinese yam (Dioscorea polystachya) of the Yam Family. 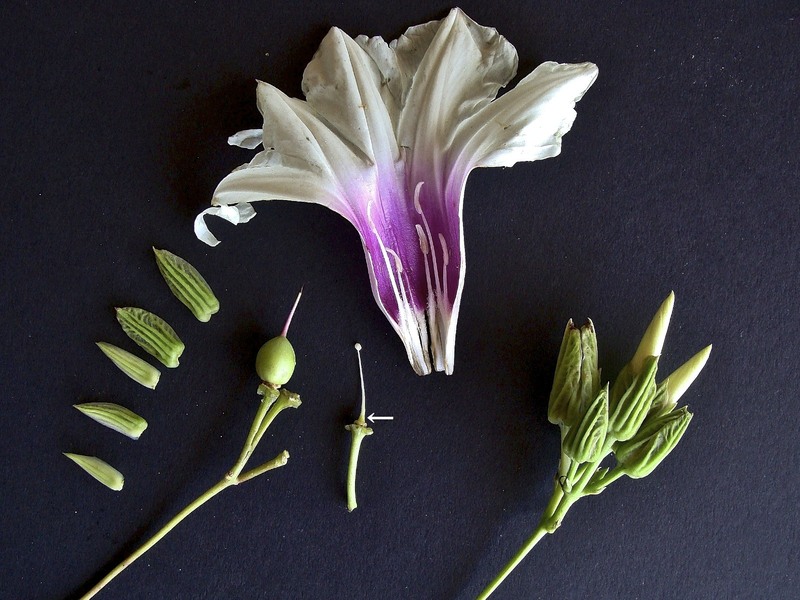 Photo 4: Cut-away of a flower: corolla with stamens attached at base, sepals on left with developing and undeveloped ovary (white arrow), center. Cluster of flower buds on right. Flowers open overnight and close, on a sunny day, about mid-day. On closing, the rim of the tubular corolla collapses inward and, along with the attached filaments and anthers, falls off the plant. The calyx persists. Pollinated flowers develop round (in cross section) slightly elongated dark brown capsules with four segments that are roundly tapered at apex and base. Part of the style is retained as a point, as is the calyx. There are two to four seeds per capsule. Seeds are flat, round in outline, deep brown, with long matted dense hairs along their edges. The sides of the seeds are much less hairy or hairless. Empty capsules and calyces are persistent on dead vines into winter. 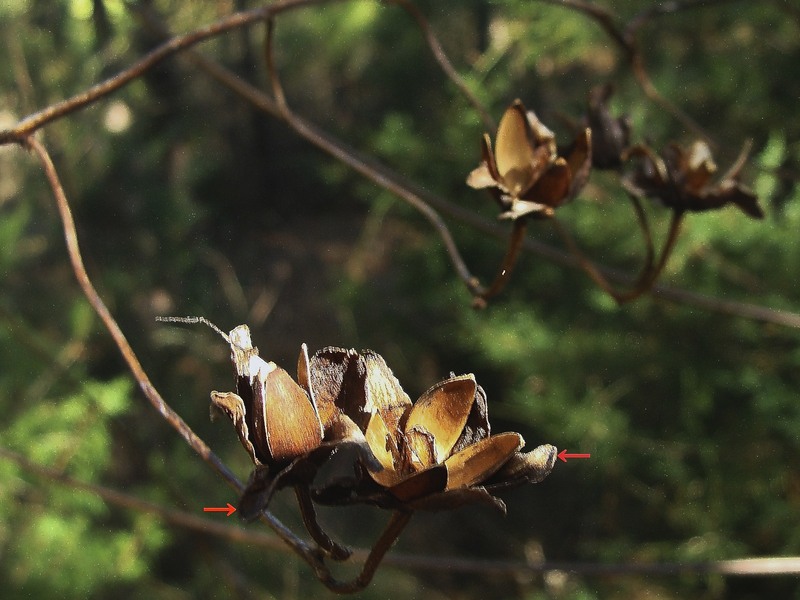 Photo 5: Empty seed capsules in mid-winter. Calyx remains (see red arrows). 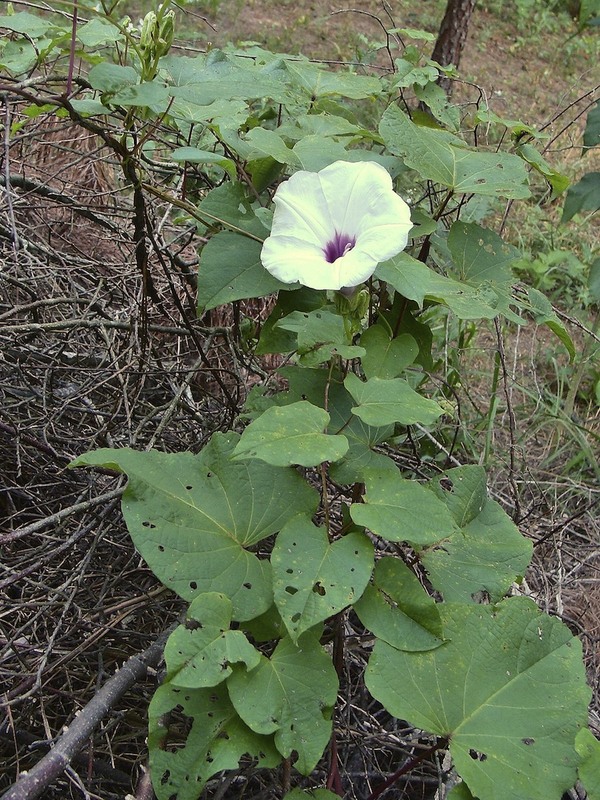 This entry was posted in Know Your Natives, Native Plants, Vines, Wildflowers and tagged Convolvulaceae, Ipomoea, Ipomoea pandurata, Know Your Natives, Wild Potato Vine. Bookmark the permalink.